There’s not a lot to look at outside this time of year. Maybe that’s why I enjoy watching the birds. Of course, the best way to attract birds is with bird-feeders. And I like knowing that it helps the birds, too. A study conducted during a Wisconsin winter showing that black-capped chickadees with access to human-supplied bird seed had a winter survival rate almost double that of chickadees without access. Because there aren’t many insects available over the winter, most of the birds that winter here are seed eaters. Some seeds are better than others, however. Seeds and nuts with a higher fat content are best for winter feeding—black oil sunflower seeds and even peanuts. 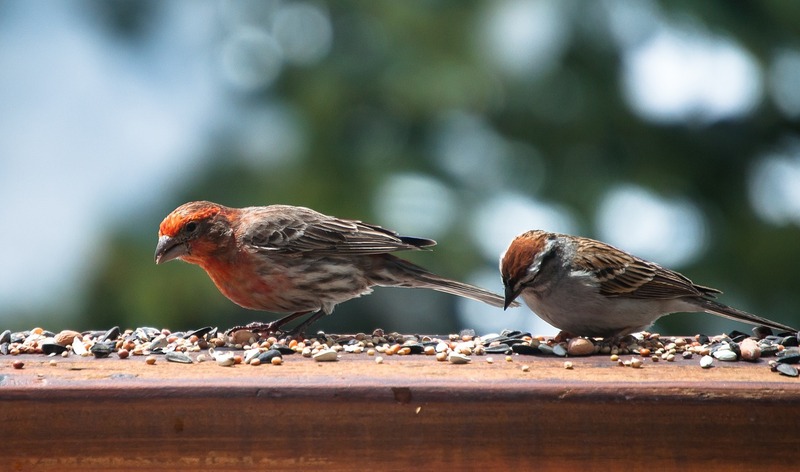 Can you use mixed bird seeds? Sure, but be sure to read the label, avoiding too many fillers like red millet, milo, and wheat. A good mix should contain a large percentage of black oil sunflower seeds, white millet, even cracked corn and/or peanut bits. Remember, too, black thistle seed (Niger) to attract goldfinches. Suet, rendered beef fat, is a great energy source and a particular favorite of woodpeckers. You can buy prepared suet cakes or make your own and add birdseed, chopped peanuts, diced apples, etc. Ask the meat department at your local grocery store if they have leftover beef fat trimmings you can “melt” down. Birds enjoy the moisture content and vitamins they find in various fruits so place aluminum pans filled with chopped grapes, apple tidbits, banana or orange slices—even chopped raisins or dried cranberries which have been soaked in water first. Fruit will attract the widest variety of birds. Wash fruit carefully or buy organic to minimize pesticide residues. For long term bird-feeding, there are trees and shrubs like winterberry holly, American Beautyberry, Sweet Bay Magnolia or viburnums which have winter fruit/berries. It’s also good to provide a ready water source—a heated birdbath or pond with running water. At the very least put saucers of water out on mild days. Finally, here is my recipe for a fun little suet “treat.” Melt down beef fat trimmings and pour into an ice cube tray. Add diced apple, raisins that have been soaked in water for an hour or two, chopped peanuts, etc. When they’ve cooled, you can place a couple of pieces on a little plate or tie them with a string and hang on a branch.